It took me over a year to play through The Legend of Zelda: Twilight Princess. It’s not a huge game, really, but my noncommittal nature of lazy-casual gaming left me visiting Hyrule only about once or twice a month for a couple hours. Via Gamecube emulation. 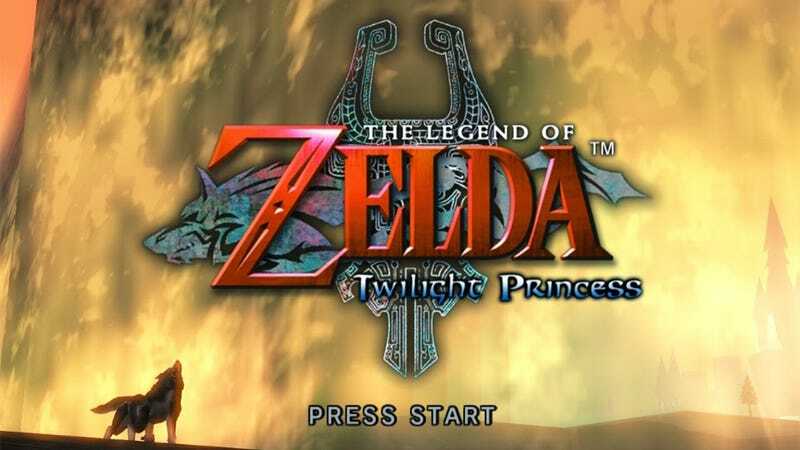 The Legend of Zelda: Twilight Princess is Nintendo’s final Gamecube entry into the series, simultaneously released for the Wii. It’s often describe as the “realistic” Zelda game, but this ain’t a gritty Christopher Nolan reboot. It’s just tad more grit than the appealing cartoon land of of the Wind Waker. My experience with the game was inexorably tied to how I played: with the Dolphin emulator on a laptop that definitely doesn’t have gaming-level specs. It largely ran very adequately, 30 FPS or so most of the time, but large, widespread areas in the game caused incredibly tedious slowdown, which did damper my enthusiasm to explore the world map. I avoided the open fields of Hyrule as much as possible because it was so slow, and, in what seems to be a quirk of this particular emulation process, seemed to actually get slower as the game progressed. These technical frustrations are part of why I would ditch the game for weeks on end until I had nothing better to do with my weekends. Luckily more confined spaces, like the dungeons, ran very well. And many of the dungeons are wonderfully designed! With a better video card, though, you can up-res the game to your 4k heart’s content, and there are even high-res texture packs available if you want to push it beyond its original design (high-res textures pictured above). But even running at the Gamecube’s native resolution of 640x528, Twilight Princess is quite a strikingly pretty game. It’s about a decade old, from the very end of the Gamecube’s life-cycle, and can’t be compared to the technical sophistication of contemporary console games, but a billion polys on screen don’t mean a thing if you ain’t go that... Triforce. I’ve written blowhardedly about the “impressionistic” art that technical limitations forced upon game design, and I think Twilight Princess lies in an interesting place between what’s currently capable with modern real-time graphics—seemingly infinite polygons and textures—and the abilities of the now-humble Gamecube. The game very often oozes with atmosphere, from the impressive Temple of Time ruins to the town square and Link’s charming Ordon village. I hate myself for saying this, but it feels like a Kincaid painting. Some people described Twilight Princess as the “gritty” Zelda game that some players wanted after the more light-hearted aesthetics of The Wind Waker, but I don’t think gritty is the correct descriptor. It’s really just a high resolution Ocarina of Time aesthetic with perhaps a slightly more realistic edge. The design and art direction is all quite lovely and inventive. The use of “pixels” as a motif for the shadow world and their right-angled patterns, sometimes accompanied by a distinctly blippy musical cue, is a very interesting meta appropriation of past video game aesthetics blended with an almost Aztec or Mayan-like style of stonework. Moreover, all of the character designs are very unique and often creepy. I think Midna, the adorable magic imp that accompanies you through the game, is just a delightful design. I would buy a figurine of Midna to sit on my desk next to my WALL-E toy. I would high five Midna cosplayers. I recall reading somewhere that the hallmark of a good character design (or logo design for that matter) is that you can see it in silhouette, with no further information, and it’s still recognizable. Midna fits that bill for sure. And, spoiler alert (lol), at the completion of the game Midna returns to her true form as a rad beautiful gnarly twilight princess, another great design that surely launched a thousand DeviantArts. But really, gameplay mechanics aside, everything in Twilight Princess just looks really cool. I’ve never played Skyrim, but when I think of Skyrim, I picture a bland, realistic, indistinct medieval tree simulator. Twilight isn’t that. Twilight’s got style. It’s not all great. I felt a distinct lack of surprise playing this game. We know what a Zelda game is, we know that we go from dungeon to dungeon and get a new item with new abilities every time. Sure, it was surprising that I would be spending a significant portion of the first part of the game playing as a dog, but that felt like the only real deviation from the precedents set in Ocarina of Time. That, and some new swordplay mechanics that are pretty cool. Link learns more complex sword moves as you progress through the game, and the most difficult mini-boss sparring matches can be a bit challenging and satisfying. I can’t imagine using a Wiimote though, and the majority of players experienced this game on the Wii. The story of the game, well, I wasn’t very invested in the story. It was all fairly unremarkable and I just wanted to slash some baddies and solve dungeon puzzles. This is in part due to the nature of how I played: like, once a month for a couple hours, and whenever I returned to the game, I didn’t really remember what I had just accomplished and where I needed to go. So I regularly consulted guides online, as I didn’t have the patience to wander around. My mediocre recollection of the story is as such: There’s a twilight world and the “normal” world of Hyrule, and the dark world has bled into Hyrule. Because of nefarious reasons! Whatever. The central villain through most of the story is Zant (another cool creepy character design) who has taken control of the dark world, where your little friend Midna is from. Then you go around and gather all the MacGuffins, and, guess what! Ganondorf is the actual villain, in a somewhat lame and uninteresting twist. You don’t really play Zelda games for the stories though, which are largely perfunctory relative to the compelling gameplay. I also played Dragon Ball Xenoverse a little bit while going through Twilight Princess, and the unintuitive control scheme of DBX made returning to Hyrule a delight. Nintendo games are just so... playable (I’m surely the first person to notice), even if it did take me a year. All in all, Twilight Princess lacks the innovation of the preceding and following games in the series (Wind Waker and Skyward Sword, respectively), but is still a lovely game in the schema of Ocarina of Time. Three triforces out of five stars. I want a Midna toy to sit on my desk. Images via NeoGAF, Dolphin-Emu.org, Zelda Wiki.